Ankle sprains are common injuries that occur when ligaments are stretched or torn. The ankle sprain is the most common athletic injury. Nearly 85% of ankle sprains occur laterally, or on the outside of ankle joints. Sprains on the inside ligaments are less common. Many sprains occur when participating in sports, or by twisting the ankle when walking on an uneven surface. 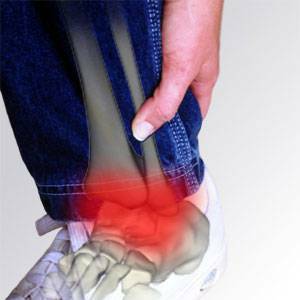 Some individuals, due to their biomechanics , are more prone to ankle sprains. Ankle sprain symptoms & classification. Ankle sprain symptoms vary depending on severity. Often, the ankle Is tender, swollen and discoloured. The ankle can be quite painful to touch. Walking is usually hampered and may become difficult depending on the severity of the sprain. A feeling of instability may occur, especially in severe ankle sprains when ligaments are torn. Ankle sprains are classified by “types” and range from mild to moderate to severe. Type I ankle sprain, the least severe, occurs when ligament fibres have been stretched or slightly torn. Type II sprain occurs when some of these fibres or ligaments are completely torn. Type III, the most severe, occurs when the entire ligament is torn and there is significant instability of the ankle joint.